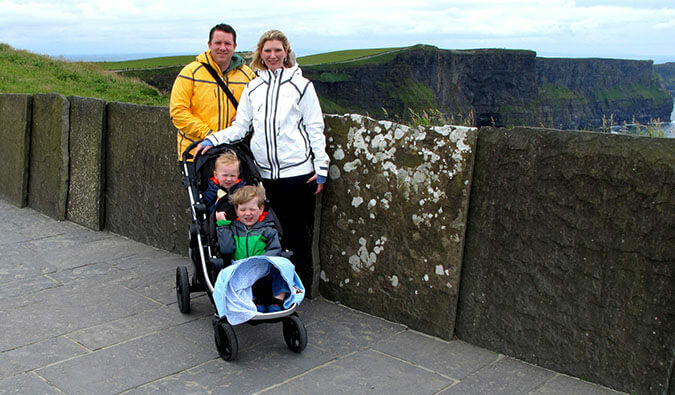 As a follow-up to last week’s guest post on traveling with kids, this week I interviewed the James, the family behind The Wide Wide World about what it is like traveling as a family together and how that affects the family relationship. Nomadic Matt: Did you have reservations about traveling as a family? [Craig] We did. We knew that this trip would mean we’d go for long stretches seeing only each other, 24/7. That can challenge any relationship. But we also saw the opportunity – the chance to spend quality time with our children before they left us. I think we all agree that we’ve gotten along better than we could have hoped. [Dani] I agree – I think we have grown closer as a result of this trip. Over long lunches and dinners, day after day, night after night, things just spill out of your kids. We’ve learned so much about their lives as a result of our time together. And I think we all see each other more clearly for the people we are. Extended travel as a family can be challenging at times, but for us, it has really been worth it. How did you come up with the idea and plan this trip? [Craig] This trip grew out of an on-going conversation that Dani and I had been having. We knew that in June 2008 both of our kids would be changing schools. Caroline was going to be entering high school; Conor (age 11) would be heading off to middle school. We knew that if we were ever going to do something out of the ordinary, this was the year to do it. The first idea I suggested was to live a year in Australia. I have friends there, and I found that we could enroll our kids in Australian public school for a modest amount of money. Dani didn’t say no, but she wasn’t excited about the idea. She thought living in Australia would be too similar to living in the U.S. So we tried to expand our thinking. 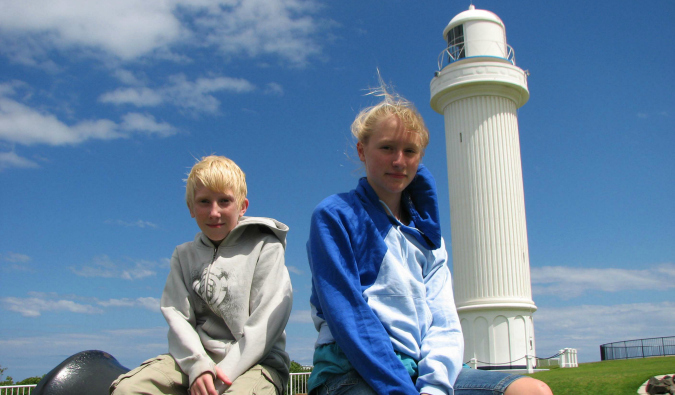 One day, we found a Canadian family, the Carlsons, who took a round the world trip in 2001. We read their web site, then emailed them. 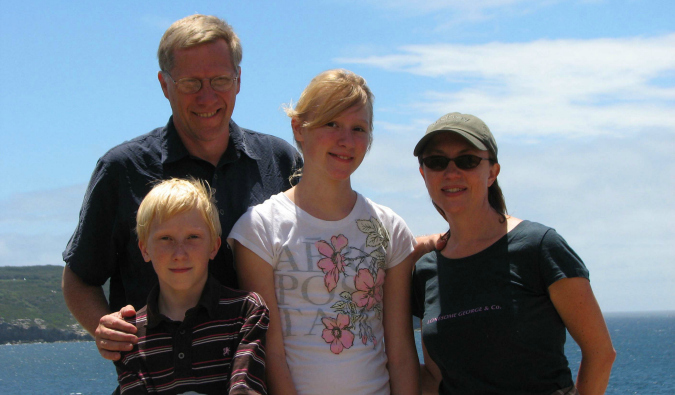 Five years after the Carlsons returned home, they were all doing well and considered their trip around the world to be a life-changing experience. One day Dani came running in my office (I work at home) and told me to turn on Oprah. Dani rarely watches daytime TV, but happened to have it on that day. When I tuned in I saw why Dani was so excited. Oprah was doing a satellite interview with the Andrus Family of Atlanta, Georgia, from the top of Table Mountain in Capetown, South Africa. I immediately went to their blog and read every word. I think that’s the moment I knew our family could do a round-the-world trip too. We spent a lot of time talking about where we would go, what we would do, what life on the road would be like. We had a very open discussion about our expectations and our concerns. The more we talked about it, the more we wanted to do it, and the more we believed we could do it. We knew it would a challenge, that there would be good days and not-so-good days. Still, we all knew it was the chance of a lifetime. [Dani] Telling our families was, without a doubt, the most difficult part. For our parents, the idea was so far from their realm of experience. They had no way to comprehend what we were doing. Still, once they got over the initial shock, our families have been supportive. One of the things that has surprised us most — something we never predicted and didn’t expect — is the wide range of reactions from our friends and family. We have casual friends who have adopted our trip as their “cause,” sending us information about every stop on our itinerary. And we have good friends who do everything they can to avoid even acknowledging that we are going to be away for a year. One family in our neighborhood studiously avoided mentioning our trip to either Craig or me. But they pumped our kids for information at every turn. But frankly, for most people, it’s out of sight, out of mind. We won’t exist till we are back home. On the other hand, we’ve also been surprised by the number of people who have reached out to us, offering encouragement and advice. 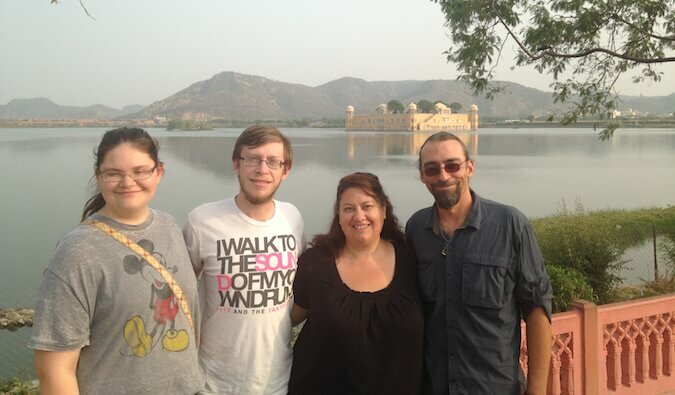 Several other travelers [including Nomadic Matt, we are proud to say] have found us on the web and been very helpful. There really does seem to be a different spirit among travelers. It’s refreshing to talk to people who share information rather than hoard it. What has life on the road been like? [Craig] Life on the road has been like life at home, only different. Traveling for a year seems so exotic, and it is at times. But you still have to find a place to sleep, food to eat, and something to do each day. The difference, though is the excitement of constant change, amazing places and the opportunity to meet interesting people. [Dani] It’s an odd experience to see a great site like Machu Picchu in the morning and then homeschool your kids in the afternoon. There are challenges in moving your life to a new town or a new country every few days. But the opportunity to see the world makes the challenges pale in comparison. 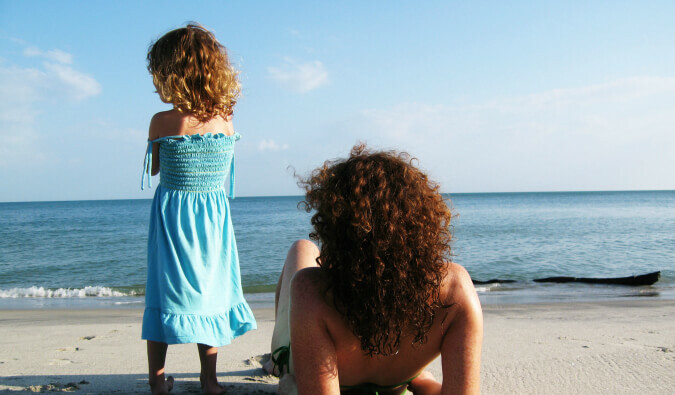 What unexpected things has traveling as a family brought you on the road? [Dani] Every day brings something unexpected. A sight. A sound. A new person or experience. We have come to expect the unexpected. The best surprise, though, has been the opportunity to gain a real appreciation for the people our children are becoming. It’s been wonderful to watch. I think some of the best surprises — and most unexpected lessons — have come from the people we’ve met. We’ve been fortunate to meet some great people — other travelers and locals. Another important lesson has been the way we’ve been welcomed everywhere we’ve traveled. People have treated us very well, and I think our children have learned not to be afraid of the world, other people and other cultures. 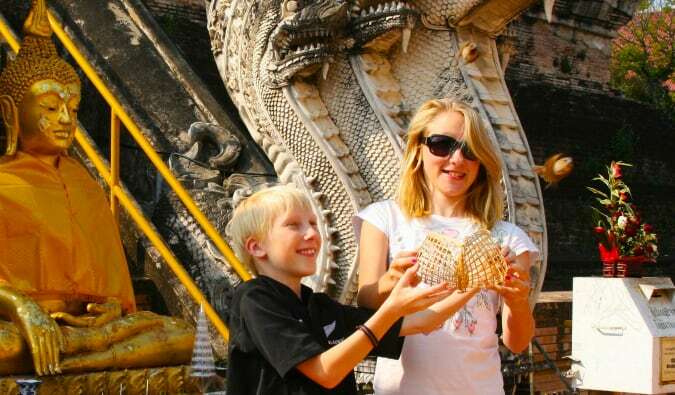 Do you have any advice for other people thinking about traveling with kids? [Craig] If a person or family really wants to take time off to travel the world, they can figure our a way to do it. It may take some creativity. It may take some compromise. But it can be done. But the first step is really wanting to do it. 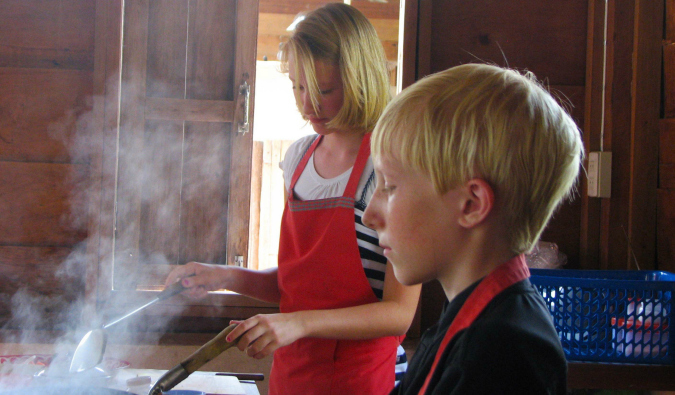 In my search for other families traveling the world, I discovered a Kiwi family of ten (ten!) who are currently traveling through Asia as part of a multi-year travel adventure. They saved for this trip, pinching pennies, for years. But family travel was their dream — and they worked together to achieve it. You have to respect and admire that. Every day I am acutely aware of how fragile it all is. As we have traveled this year, there are two thoughts I keep coming back to. First, I have a new appreciation for what’s possible, for what a family can do together. I have nothing but admiration and respect for the many families who are out there living their lives on their own terms. That’s what I aspire to. Second, I am deeply grateful for my wife and my children, for their spirit of adventure, for their willingness to take a leap of faith into the world. I hope they never lose their sense of wonder, their willingness to break from the pack, and their ability to confront their fears, take a risk and move forward. This trip is the best thing we’ve ever done. I can’t wait to see what happens next. Were you excited to travel for so long? Were you excited to travel with your family? [Caroline] I had mixed emotions about traveling for so long. I was excited by the idea, but I was also afraid. Plus, I didn’t want to miss my friends and my first year of high school. And I was worried about being with my family 24/7. But I’ve been able to stay touch with friends through Skype, Google video chats and Facebook. And we have all gotten along and grown closer. [Conor] I was excited to travel and see the world. I knew it was a special opportunity to do something not many other people get to do. I have missed my friends, but it has been worth it. The hardest time has been around holidays like Christmas. That’s when I miss normal life. What is the coolest thing you have done? What has been the worst? [Caroline] We’ve done a lot of cool things. I really liked zip-lining in Ecuador, swimming with sea lions in the Galapagos, and taking care of elephants in Thailand. I really liked traveling in New Zealand, Australia, and Japan. The worst thing we did was to ride a really dirty bus across northern Argentina. It was nasty. [Conor] The Galapagos were great. I liked living on a boat and traveling from island to island. I also liked all the adventure sports in New Zealand, especially zorbing. And it was really cool to ride a mile long luge from the top of The Great Wall. There haven’t been too many bad things. I suppose the worst thing has been all the time we’ve spent waiting in airports or at train or bus stations. Are you glad you did this? Do you want to travel in the future or has this experience made you hate traveling? [Caroline] Now that we are almost done I’m really glad we did this. I feel like I’ve done something that very few people will ever do. I do think I will travel in the future, but probably not for this long. One day, I would like to return to Thailand to work with the elephants at the Elephant Nature Park near Chiang Mai. [Conor] I am really glad we did this too. I’ll be glad to get home, but we have been able to see and do so much. In the future, though, I don’t think I’ll travel for this long. I think I’ll take more trips, but for shorter periods of time. There is so much to see in the world, you can spend your whole life exploring. Go read their blog and follow them around the world at The Wide Wide World. Great interview. It’s interesting how something so different can become commonplace for this family. Plus, I totally can relate about telling the family of your travel plans, it’s just too far out of reach for them to fully comprehend. Great interview – the James family has been an inspiration for us and countless others, I’m sure. I’ve been traveling the world with my family for the last several months, too, and I agree with Craig – it’s an incredibly rewarding experience, and anybody can do it. I always think of it as a very, very good life education! Instead of reading in books, the’ve experienced it. Can’t beat that! This is an inspiring journey! Travelling solo for a year is one thing, but travelling long term with my family one day is another kettle of fish! Well done to the James family. Keep living and keep learning about this amazing world! I’m glad your children have had this amazing opportunity and I’m sure they will be better people for it. Thanks for posting this Matt. Great interview Matt! Really love that you got the kids perspective. Traveling families, for me, are the ultimate inspiration. Traveling solo is easy.